Last Friday we surprised the kids with a trip to Ocean City. They both knew something special was going on, but neither had a clue until we picked up Aidan at school and pointed out that there was luggage in the back of the van. For some reason, Aidan thought that the special surprise would be a TV that would be mounted on the ceiling directly over his bed. Not sure where that came from, but he wasn’t disappointed with the truth. We drove in the rain for three hours before reaching the island. Lisa had booked the hotel and was told by the manager that it was a block from the beach, so when she forgot to print directions, we figured it shouldn’t be terribly hard to find. Unfortunately, we were assuming that the manager was telling the truth. It didn’t bode well when we found the hotel three (actually about six in distance) blocks from the beach. This established the “South Jersey Block” as a new measure of distance for us. Our “spacious room” at the Sun Beach Motel was not. In order to pull out the sofa bed for the kids, we had to move a table in front of the door to the room. Unfortunately the worst was yet to come. Your motel room should never further your child’s understanding of entomology. Legs up, right by the table, was one very large (and very dead) cockroach. A quick look around the room revealed that he had other fallen comrades. When I confronted the manager about this, he was apologetic and switched us to another room further away from the battlefield. They had recently had an exterminator in to deal with the problem and it was localized towards the end of the building we had been in… or so he claimed. Later that evening, we found another dead cockroach, and started packing up the van. Quite fortunately for us, the Oceanfront Motel had vacancies. We were now in a motel right on the boardwalk. Two real beds, much larger room, and… a view of the ocean from our window. The only bug we found was a dead gnat. I can live with that. If you’re ever in Ocean City NJ, stay at the Oceanfront Motel. I can’t say enough nice things about them, and that’s not just by comparison. Now our vacation was back on track. Even Saturday’s weather was perfect. We started the morning with a nice pancake breakfast at Bob’s and then played on the beach for a while. The boys chased some seagulls and collected shells as we walked. The water is too cold for swimming at this time of year, but that didn’t stop the boys from getting their feet wet. I ran back to the van and assembled Eamonn’s Sponge Bob kite, which flew with ease on the windy beach. He was thrilled and we all took turns flying it for a while. Lots of photos were taken. Afterwards, we walked the boardwalk. Lisa did some shopping and the boys and I got sunglasses and hats. By then, it was too late for me. I currently have the head of a lobster. Ouch. We went on the carousel and played some games. Eventually Eamonn couldn’t walk anymore and I had to carry him back to the motel, where after a short rest, the boys and I went back to dig in the sand while Lisa relaxed. That night, we all slept very well. We were all sad to see our mini vacation come to an end on Sunday. We’ll be back next year though. Same hotel and possibly for a longer stay. Lisa is attending the National Polymer Clay Guild Synergy Conference in Baltimore, so the boys and I are home alone. 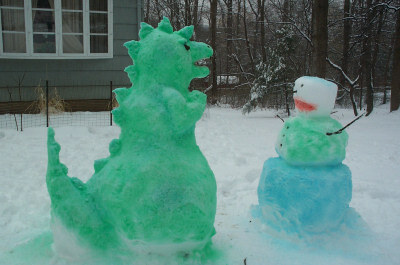 There was enough snow last night that none of us had to go to school or work today, so we decided to have a little fun. Aidan named the monster Zieful. The snowman will just be Snowman #1. We don’t expect him to survive. This is my youngest son. He’s four and readers of this blog know that he’s been a bit of an adventure this year. To recap, earlier this year, he woke us in the middle of the night and had to be rushed to the hospital. This innocent little boy is also the person who bruised my rib a few months ago. And there is so much more. My wife is taking a class this weekend and won’t be back until Sunday. She left me alone with the boys, which is something that usually turns into something half party, half whirlwind housecleaning. Today, during the fun section of our day, Eamonn (as he often does) went upstairs to play while I stayed downstairs with Aidan. Nothing out of the ordinary. But wait… it’s too quiet. Eamonn isn’t quiet. Not even when he sleeps. I go upstairs. No Eamonn. I check the bathrooms. No Eamonn. I check the front door. Locked. Now I’m calling him. Louder. Louder. LOUDER. Not a peep. Eamonn can’t play hide and seek without giggling, so I’m beginning to think he’s hurt somewhere. The back door is locked. The basement locked. I’ve been through all the rooms a few times. Bathtub empty. Under the sink, no. Under the bed, NO. I’m very seriously concerned and his brother has now joined the hunt. We’re running around for what feels like forever (but more probably 30 seconds) when I cross paths with Aidan again in the living room and hear something. I am so doomed when he becomes a teenager… if I live to see it.